The mission could provide clues to the origin of the solar system. TOKYO — A Japanese spacecraft released two small rovers on an asteroid Friday in a mission that could provide clues to the origin of the solar system. 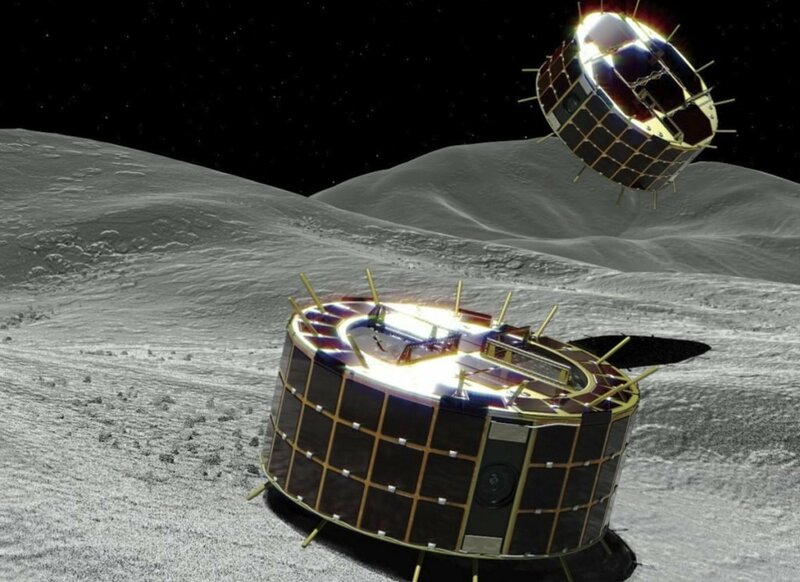 The Japan Space Exploration Agency said the two Minerva-II-1 rovers were lowered from the unmanned spacecraft Hayabusa2 to the asteroid Ryugu. The spacecraft arrived near the asteroid, about 170 million miles from Earth, in June. JAXA said confirmation of the robots’ safe touchdown has to wait until it receives data from them Saturday. Hayabusa2 approached as close as 180 feet to the asteroid to lower the rovers, waited for a minute and then rose back to its waiting position about 12 miles above the surface. JAXA said the release went successfully. The solar-powered rovers’ voltage plunged as night fell on Ryugu, a sign that they are on the asteroid, said Hayabusa project team spokesman Takashi Kubota. The two tiny rovers, each about the size of a cookie jar, are to capture images of the asteroid and measure surface temperatures before a larger rover and a lander are released later. The rovers move by “hopping” up to 50 feet at a time because the extremely weak gravity on the asteroid makes rolling difficult. They can continue jumping as long as their solar panels and power last, JAXA said. Friday’s release bolstered the project members’ confidence ahead of more difficult maneuvers in the future, Tsuda said. Hayabusa2 is scheduled to attempt three brief touch-and-go landings on the asteroid to collect samples in hopes of providing clues to the origin of the solar system and life on Earth. Since it arrived at Ryugu, scientists have been looking for suitable landing sites on the uneven surface, and its first attempt is expected in October. The spacecraft is due to release a German-French lander called MASCOT carrying four observation devices in early October and a bigger rover called Minerva-II-2 next year. Hayabusa2, launched in December 2014, is due to return to Earth in late 2020.